The actual wedding ceremony itself is really the most important part of the day. This is what all of your guests have come to witness and the reason for the celebration! So don't forget to really consider the design of your ceremony. When having your ceremony on the beach there are few more things to consider, Caribbean Catering has a few tips for your beach wedding ceremony. Many couples who opt for a beach ceremony are not sticking with traditional and do not require their guests to sit as guests of the bride and guests of the groom. Open seating makes it easy for your guests and keeps an inviting atmosphere. Since it is an outdoor affair guests will have more than one entrance to the ceremony area so keep it simple. Most only reserve the front rows for immediate family who will be walking down the aisle, such as parents and grandparents. In this case you won't need ushers although if you are going to have programs be sure to assign someone the duty of handing them out. Also consider getting sign to let people know that they can sit on either side, like this one. When choosing your seating design consider the size of the property you are working with and the amount of guests you will need to seat to be sure there will be space for your desired layout. Most of the properties we work with lend themselves to a particular style of ceremony layout and we are more than happy to do a walk through with you to go over your options at your desired venue. When having a beach wedding you may want to think about getting an archway of some type for your ceremony. Some properties have landscaping and structures built in to frame your ceremony. If it doesn't, an arch really adds that drama to your ceremony design and gives you a nice focal point. There several different styles available, these are some that we have done in the past. You will want to carefully consider your footwear for both you and your guests. Outdoor surfaces like grass or sand can be difficult to navigate in pumps. Wear wedges or flats for an easier time and be sure to let your guests and wedding party know what the appropriate footwear will be. On grass or sand a fabric aisle runner usually won't work out all that well. It can easily catch on your shoes since the surface is uneven. Sturdier constructed pieces tend to lend themselves better to outdoor ceremonies like bamboo or boardwalk. Beach wedding ceremonies may have different aspects to consider than a traditional ceremony but are always beautiful. 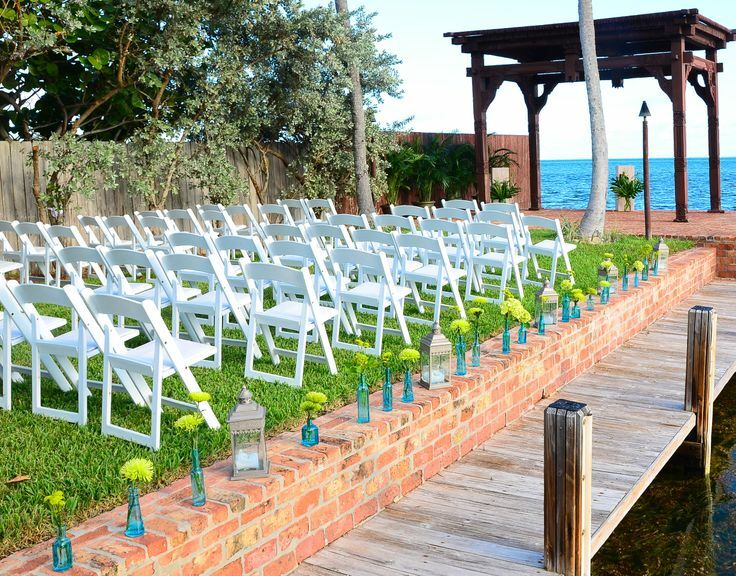 Who wouldn't like sand between your toes and a beautiful keys sunset as your ceremony backdrop? Contact us at Caribbean Catering for more ideas on your beach wedding ceremony.